Google Safe Browsing gives users tools to help protect themselves from web-based threats like malware, unwanted software, and social engineering. We are best known for our warnings, which users see when they attempt to navigate to dangerous sites or download dangerous files. We also provide other tools, like the Site Status Tool, where people can check the current safety status of a web page (without having to visit it). We host this tool within Google’s Safe Browsing Transparency Report. As with other sections in Google’s Transparency Report, we make this data available to give the public more visibility into the security and health of the online ecosystem. Users of the Site Status Tool input a webpage (as a URL, website, or domain) into the tool, and the most recent results of the Safe Browsing analysis for that webpage are returned...plus references to troubleshooting help and educational materials. We’ve just launched a new version of the Site Status Tool that provides simpler, clearer results and is better designed for the primary users of the page: people who are visiting the tool from a Safe Browsing warning they’ve received, or doing casual research on Google’s malware and phishing detection. The tool now features a cleaner UI, easier-to-interpret language, and more precise results. We’ve also moved some of the more technical data on associated ASes (autonomous systems) over to the malware dashboard section of the report. 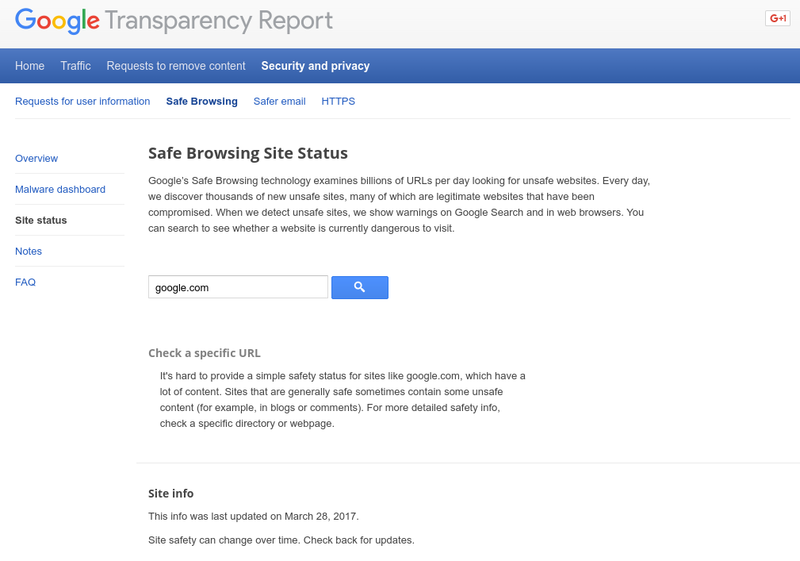 While the interface has been streamlined, additional diagnostic information is not gone: researchers who wish to find more details can drill-down elsewhere in Safe Browsing’s Transparency Report, while site-owners can find additional diagnostic information in Search Console. One of the goals of the Transparency Report is to shed light on complex policy and security issues, so, we hope the design adjustments will indeed provide our users with additional clarity.